The great lie of detective fiction is that the world makes sense: there are no coincidences; criminal motives are simple and decipherable; every clue is a step along the path to resolution. Sherlock Holmes is no match for the real world but fortunately, Trike Augustine is, at least most of the time. Some crimes are just too stupid, even for Trike, and this might be one of them. This is a hilariously weird and philosophical detective novel by Porter Square Books’ own debut novelist—a talented new voice, whose next offering I’m already looking forward to reading! How can you solve a murder when the clues are so dumb? Private investigator Trike Augustine may be a brainiac with deductive skills to rival Sherlock Holmes, but they’re not doing him any good at solving the case of a missing gazzilionaire because the clues are so stupefyingly—well, stupid. Meanwhile, his sidekicks—Max the former FBI agent and Lola the artist—don’t quite rise to the level of Dr. Watson, either. For example, when a large, dead pig turns up on Trike’s floor in the middle of the night, none of them can figure out what it means. Meanwhile, the clock is ticking as the astronomical reward being offered diminishes drastically every day. That, plus the increasing reality that their own lives are in danger, lift this astonishing debut beyond its hilarious premise—a smart man befuddled by the idiotic—and turns it into something more than just a smart homage to Sherlock (with maybe a touch of early Jonathan Lethem thrown in). It becomes a compelling and compulsive thriller . . . with the added bonus that the prose is often as breathtaking as the tale. JOSH COOK is a bookseller at Porter Square Books in Somerville, Massachusetts. His fiction, criticism, and poetry have appeared in numerous leading literary publications, including The Rumpus, The Millions, and Bookslut, and he is the blogger for Porter Square Books’ blog. This is his first novel. “A comedic mystery, filled with the sorts of digressions and lunacy that will entertain readers wondering what an episode of Benedict Cumberbatch's 'Sherlock' series might be like if it were written by Quentin Tarantino." “One of the most high-minded detective stories in years... Meticulously planned and content-rich, this sophisticated, variegated study...ranks with the best upmarket mysteries by Iain Pears and Umberto Eco." “What sets this book apart are stylized passages that illustrate how Trike thinks, and it creates a reading experience unlike any other book I have come across… A delightful novel for book lovers looking for something different." “A beautifully written postmodern novel of deduction that merrily, wittily blows up its genre’s conventions while at the same time re-energizing possibilities for the 21st-century detective story." 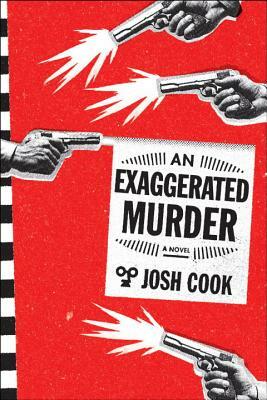 “Bookseller and debut novelist Cook’s humorous take on various whodunit and noir tropes is...spot-on." “An engrossing, dizzyingly smart plot; flawless comic timing; some of the grittiest sentences this side of Hammett—one of the most entertaining books I've read in years."